Subject: What's with the Bactrian camels? I was wondering why the camels in the game are Bactrian camels rather than Dromedary camels? 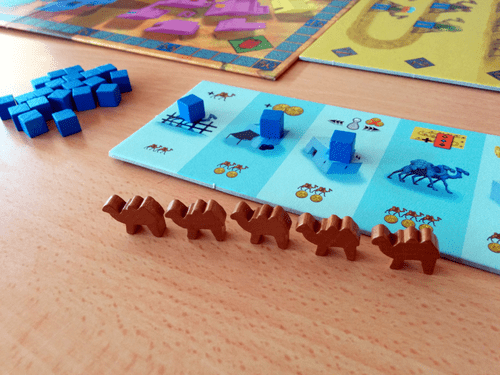 The game is called "Camel UP" because an important part of the game is to piggyback ride atop another camel. With which type of camel do you think it is easier to balance one or more camels atop of each other? Further discussion on this interesting topic HERE. OK... then why not set the game in Central Asia? That's what I mean. Basically you can have either Bactrian camels or pyramids. The Bactrian camels could race around a ruin, or a mosque. Just sayin'. I thought they were racing around a ruin. They're racing around a ruin not located anywhere near where Bactrian camels are located. I find that odd, that's all. Maybe space aliens brought them there for your amusement. May be they are tourists. However I agree with you. Although a game can be fun and silly there should be some internal logic. I have this same problem with Yspahan. This certainly disqualifies Camel Up from winning the Spiel award, doesn't it? What if kids play this and get the wrong idea about camels. I agree with you that game themes need to make some kind of sense. Perhaps the rear "hump" is merely their tail. You mean this isn't a camel racing simulation? There are pyramids in central China near Xi'an, so it's slightly less implausible than you think. Having Bactrian camels racing in Egypt really rattles my chain. I once worked in an Asian elephant sanctuary that commissioned a statue made of one of their bulls. It finally arrived and was revealed to be... an African elephant. Everyone was so sad. If you've got to make them stackable, the game ought to look like THIS.